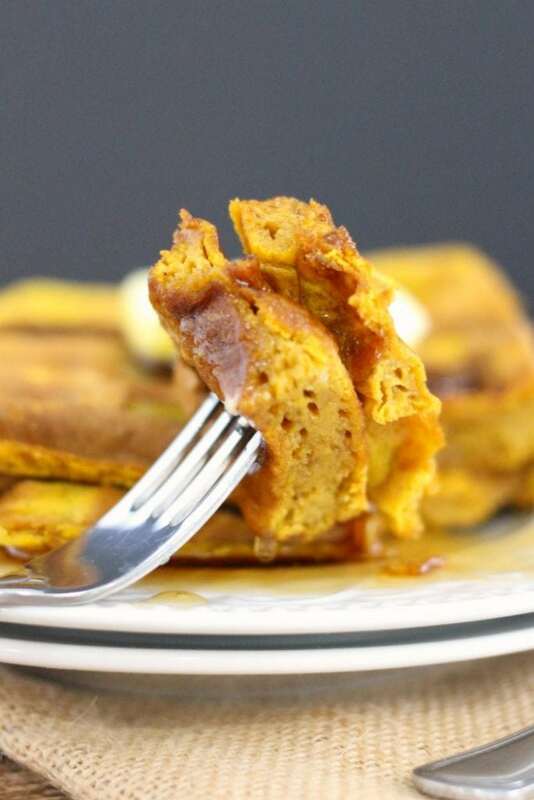 This Pumpkin Waffles recipe is the perfect simple fall breakfast idea. 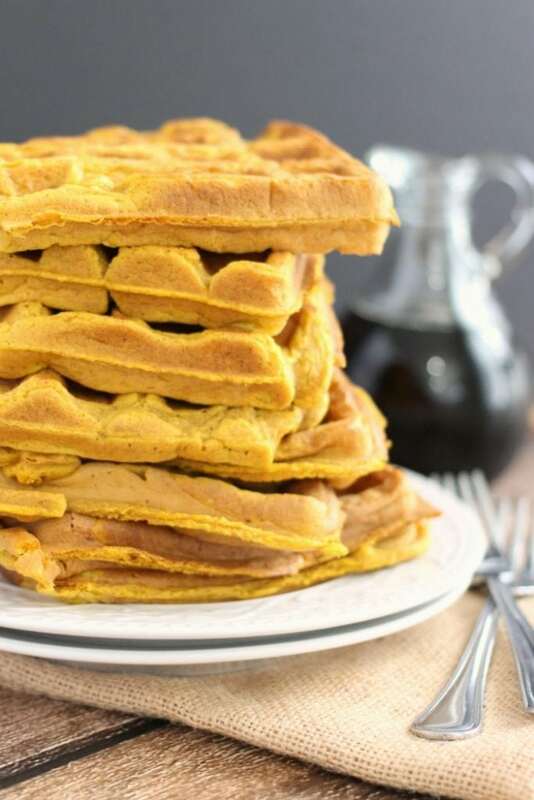 Hey there Pumpkin Waffles! I don’t know about you folks, but around here the kids are headed back to school. Which says one thing loud and clear to me – it’s time for all the pumpkin recipes! Okay, okay. And if you love waffles as much as I do, make sure to check out our huge collection of waffle recipes too! Maybe I’m a touch premature, but after the incredibly hot summer we’ve been having, my family is craving Fall weather and Fall flavors. What we’re not craving, thanks to overloaded school and activity schedules, are complicated recipes. And I suspect most folks feel the same way. 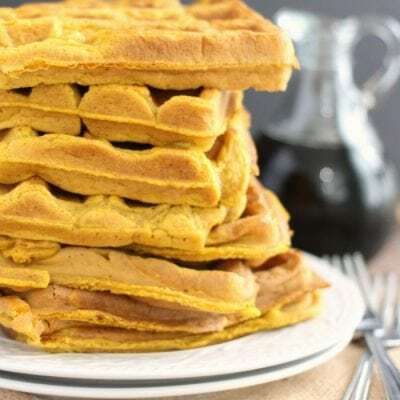 For that reason, I think you’re going to love (love, love, love) this Simple Pumpkin Waffles recipe. It’s full of delicious pumpkin flavor, and only takes 5 easy ingredients. My kids devoured them, but next time I’ll make a double (triple???) batch and throw extras in the freezer for super simple breakfasts! We topped ours with butter and pure maple syrup, but if you want to get fancy definitely try some Whipped Butter or fresh whipped cream. Mmmmmm. And be sure to serve it with a pumpkin spiced coffee (or frozen coffee drink if it’s still a million degrees where you are)! 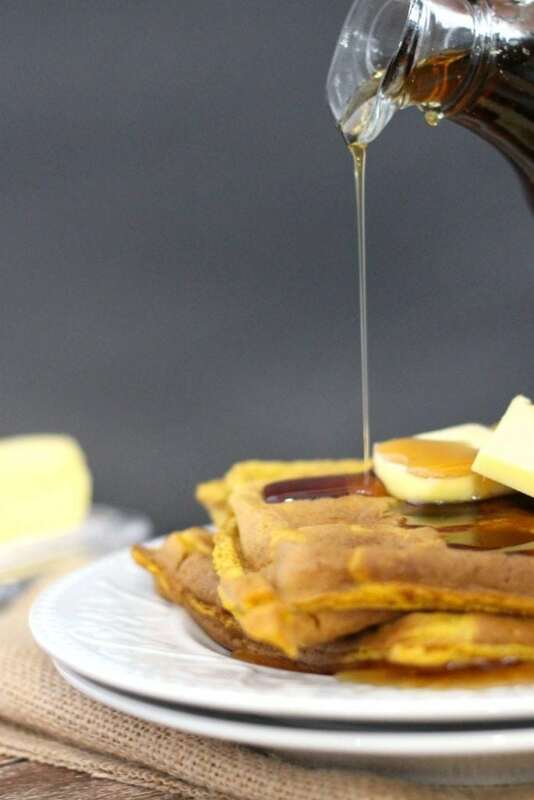 To make this recipe incredibly simple, we started with Bisquick. I’m a firm believer in using shortcuts when it will make life easier – and who doesn’t need a little help at the beginning of a new school year? She’s an exceptional cook and makes nearly everything from scratch so when she told me she loves Bisquick and to stop making things harder than they need to be, I promised myself I’d no longer feel guilty for going the easy route! See all our Pumpkin Recipes! 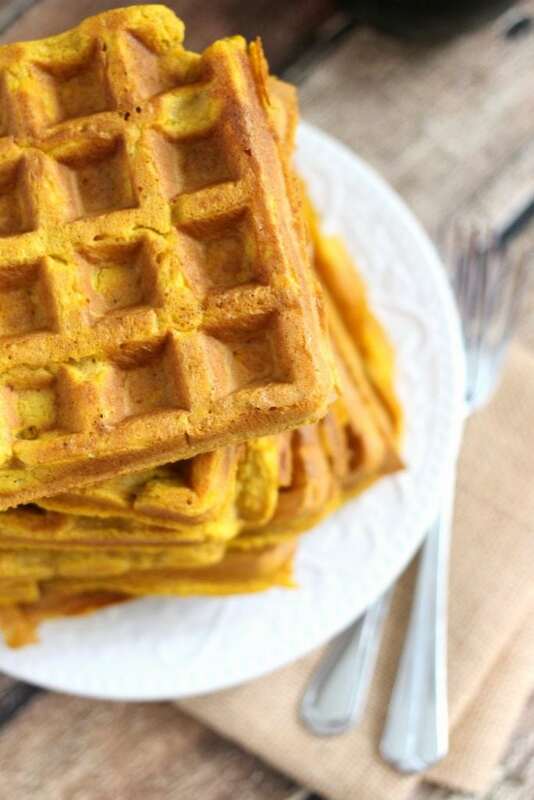 This Simple Pumpkin Spice Waffles recipe is the perfect simple fall breakfast idea. 3 tablespoons pumpkin pie spice here's how to make your own pumpkin pie spice! Whisk everything together in a large bowl, then cook on a waffle iron. Yields about 8 square waffles. I never get tired of pumpkin recipes no matter what the season. 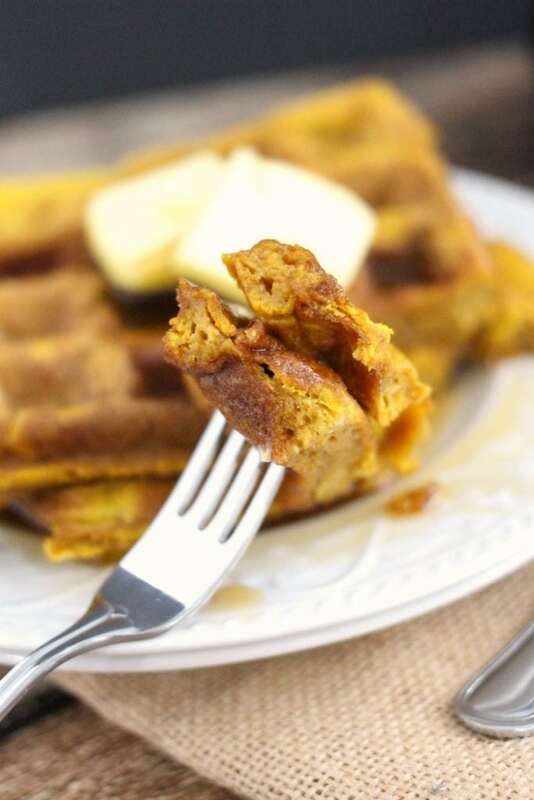 And these pumpkin waffles sound like the perfect treat to whip up in the morning. My husband will be overjoyed since one of his favorite breakfasts are waffles. I think these would be great with some pecans added in and that lovely maple cinnamon honey butter. Pumpkin flavour is one of the few ways to get some Vit A into my kids. 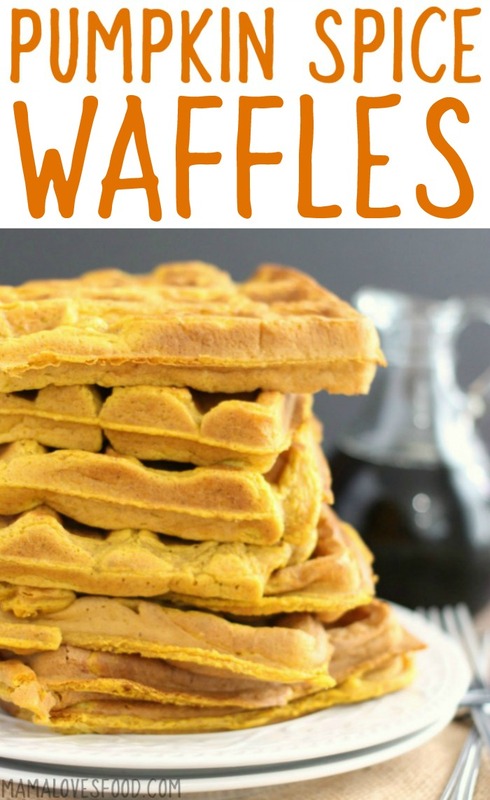 These waffles are so tasty that they’re gobbled up quickly! I wish I could hear your video, too low and can’t understand you. It is up full volume. oh no, i’m sorry! maybe try headphones?